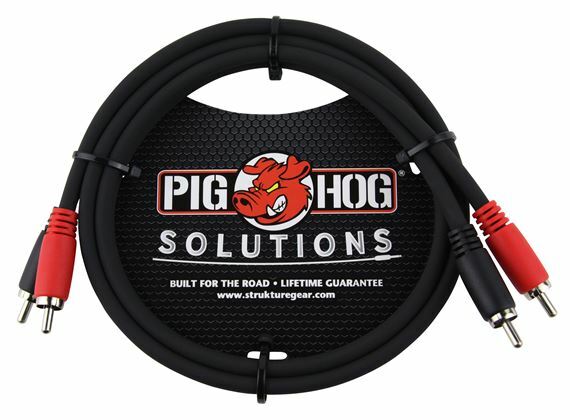 Shop Pig Hog Solutions RCA Dual Cable from AMS and enjoy Fast & Free Shipping. Dual RCA cables are a great way to keep track of stereo signals. Pig Hog dual cables feature heavy duty molded connectors with built in strain relief, color coded for easy identification of Left and Right Channels, an extra thick tour grade PVC sleeve. Get the good stuff and it lasts. Excellent cables. Absolutely would purchase again. Really good product. Used for my new stereo system & would buy again. Nice and we’ll manage cables to connect mixers and turntables.